Welcome to the Stampin' Addicts Fall Holiday Blog Hop! (Join us on Friday, October 10 for the Winter Holiday Hop.) We have several projects to show you, so I hope you'll visit us all. 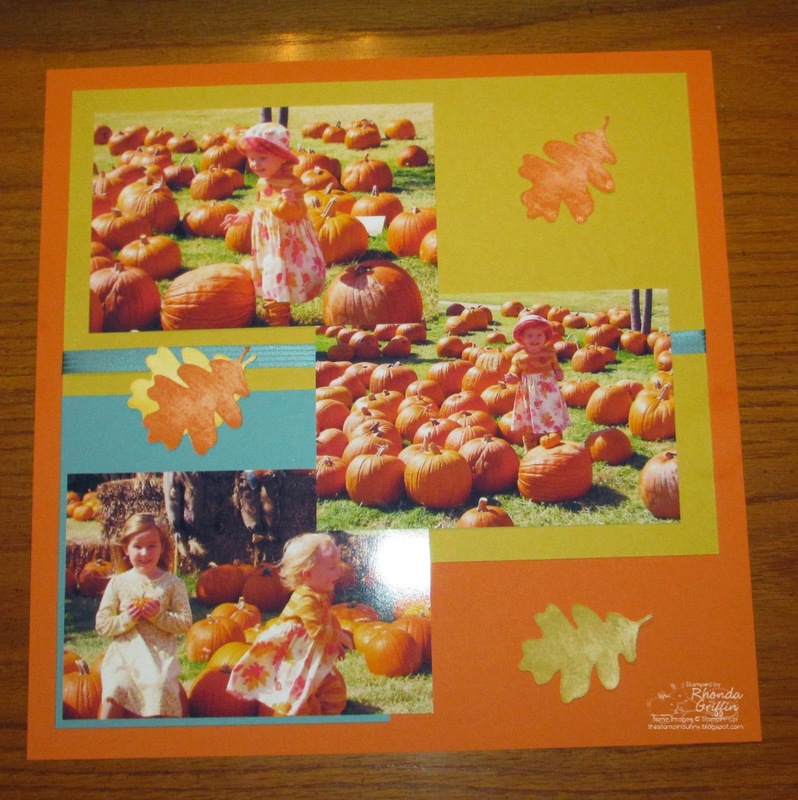 Should you get lost or want to chat about the hope, visit The Fall Holiday Blog Hop post on Stampin' Addicts. If you're traveling in order, you've just seen Carmen's lovely designs on her Stamping Addiction blog with the Frightful Wreath kit. I love that her spider is the center of the design. I think it pops So much more that way! And leftovers you can use for a card or other decor? Perfect! 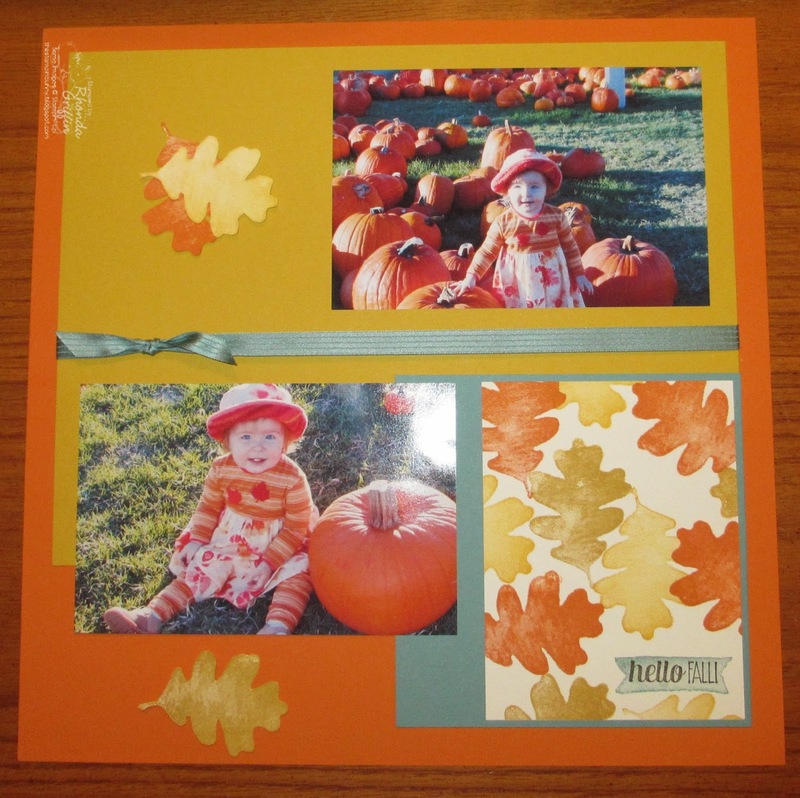 I am using the For All Things Stamp Set...It has nice textured leaves and other fall images as well as great fall sentiments. For this card, I used the Banner Framelits for the main image, and added a rhinestone bling colored with the dark Pumpkin Pie Blendabilities marker. I think it coordinates the bling nicely with the gold and Very Vanilla Metallic Baker's Twine. I added a Autumn Wooden element solid Oak Leaf to the Baker's twine and tied a bow on the top of the "leaf". The background is merely a One Sheet Wonder style stamped in Pumpkin Pie, Crushed Curry, Baked Brown Sugar and Rose Red. You may have to click to enlarge the picture to see that I used a regular Pumpkin Pie marker to color direct to stamp on the ribbon around the branches. I love the linen texture of the images too. 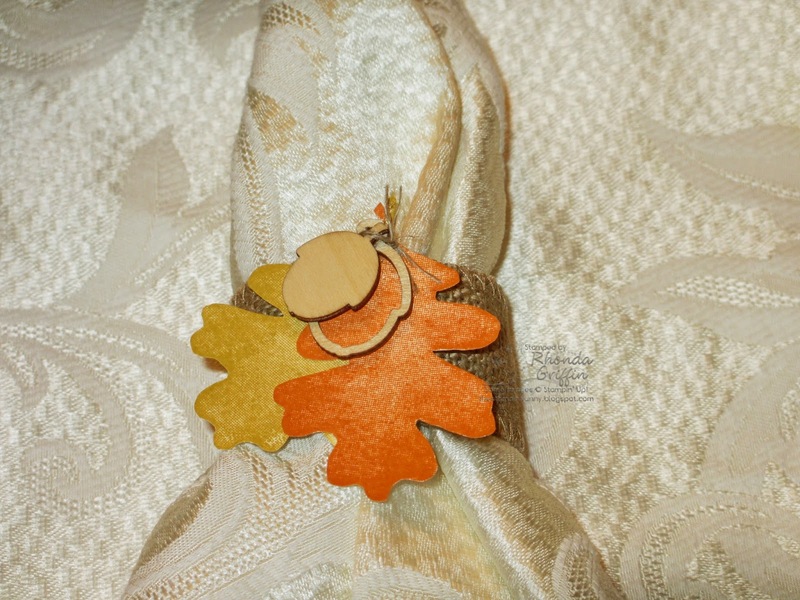 Next, I have this napkin ring....Quick and easy with the Burlap Ribbon and some cut out leaves in Pumpkin Pie and Crushed Curry. I just added some Autumn Wooden Elements Acorns with a little Linen Thread. It's time to see what wonderfully coordinated designs Tina has made using the Color Me Autumn designer series paper at her blog, Paper Art Garden. I love the great tablescape and gift designs! Thanks for visiting today! 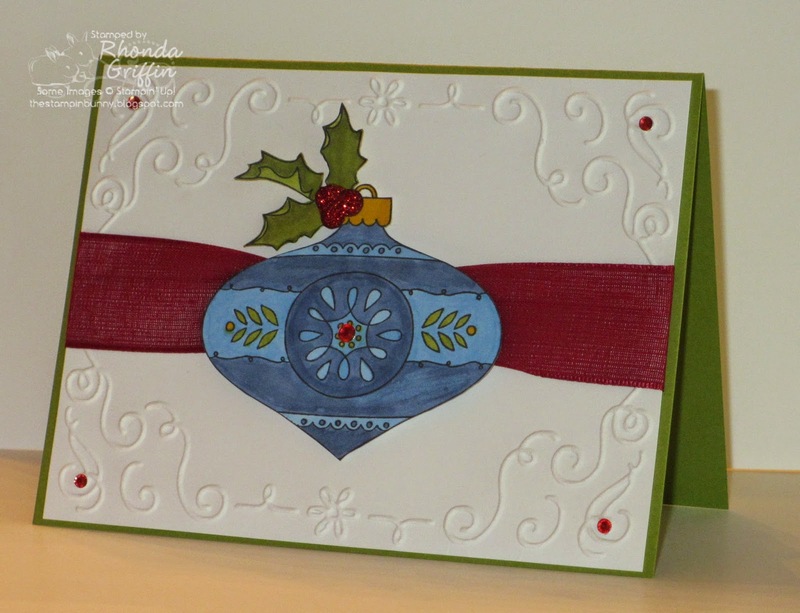 The Christmas Bauble single stamp is fun to color and easy to color with Blendabilities. I used dimensionals to mount it on the Filigree Frame embossing folder and added Rhinestone bling colored with the medium Blendabilities marker in the center and at each corner. Cherry Cobbler 1" sheer ribbon and Cherry Cobbler Dazzling Details add texture and color. For Shelli Gardner's convention presentation that demonstrators were allowed to see online, she showed a cute little nest made with our Burlap Ribbon. 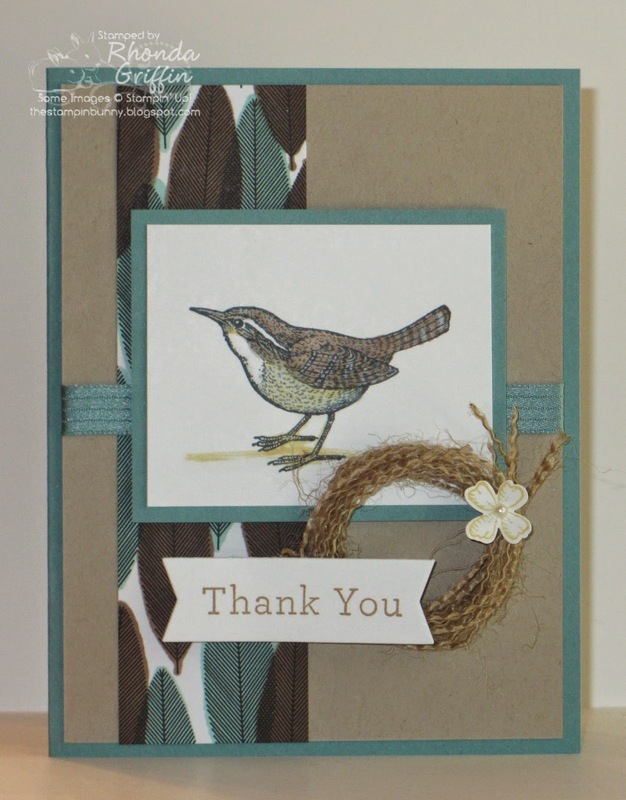 I think that will be fun for class....I used a combination of Blendabilities and our regular markers to color this little Carolina Wren from the An Open Heart stamp set. 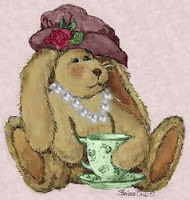 I saw coloring our Designer Series Paper with Blendabilities on a blog post from Stampin' Up! I think it is a fun way to add color to the Back to Black DSP. 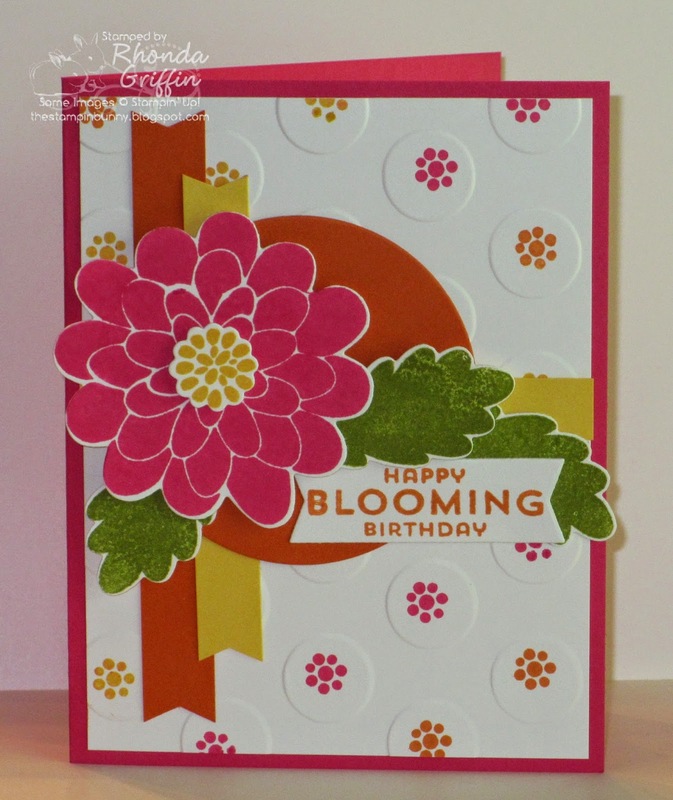 Hot summer colors on this Flower Fair Framelit/Flower Patch stamp set card. 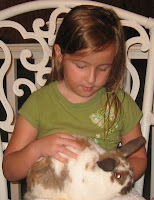 I hope you all think it is fun to make this week as well. MOJO356 made a fun sketch for this card that was quick and easy. I saw video of our fearless leader, Shelli Gardner, stamping on the large Polka Dot folder using a mask, and I thought this was another easy option.